Microscope slide format 75 mm X 25 mm. Compatible with all polymerisable gels including collagen, fibrinogen, Matrigel, etc. and combinations thereof. Gas permeable laminate for effective gas exchange. Optically clear and compatible with phase contrast, fluorescence and confocal microscopy. Enables monotypic or organotypic co-culture models. Enables the control of interstitial flow across the 3D gel region. Enables the control of chemical gradients across the 3D gel region. Designed for rapid media exchange through vacuum aspiration with no risk of over-aspiration. Designed for modular expansion with AIM Connectors. Fits into AIM Microtiter Plate Holders for easy handling and stacking. Long working regions that are easily injectable with hydrogel, with low risk of leakage. Gas permeable bottom laminate ensures accurate reflections of incubator conditions (normoxic or hypoxic). Multicellular co-culture, with meaningful organization into models of biological systems. Control over chemical gradients and flow across the gel region and/or within the media channels. AIM 3D Cell Culture Chips utilize a patented approach with a novel post design in conjunction with optimized post spacing & channel height. This allows hydrogels to be contained within gel channels during the hydrogel filling process, with little risk of leaking into adjacent channels. The DAX-1 chip, for instance, has a 14mm long gel region. The air-liquid interface is substantially flat & uniform, with minimal occurrence of concave (under-filled) or convex (over-filled) interfaces. As the hydrogel is caged within the gel channel, the meniscus that usually obstructs phase contrast imaging is also absent. In short, AIM chips make it easy for users to cast hydrogels for 3D cell culture, and provide excellent optical clarity for various imaging techniques. 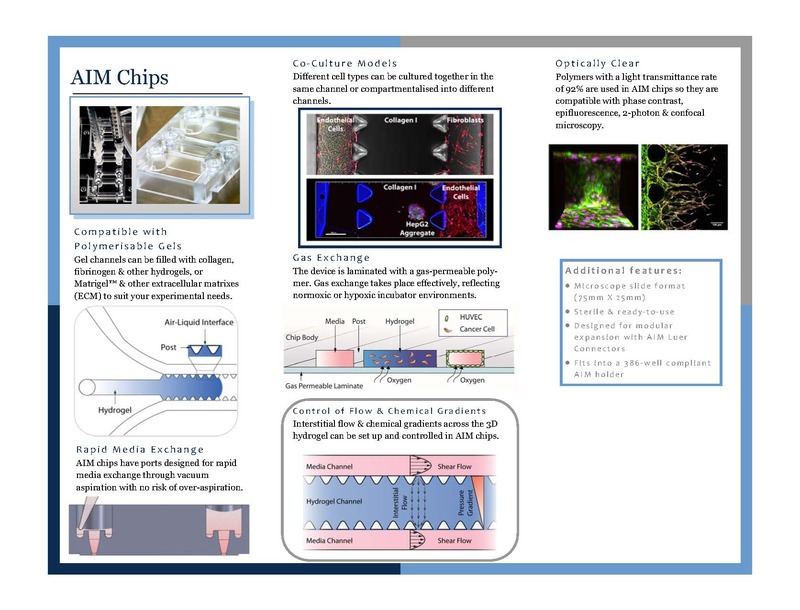 The multi-channel design of AIM 3D Cell Culture Chips enables the co-culture of different cell types in distinct compartments in the device, yet allowing paracrine signalling between cell types to take place. The movement of cells between different channels (or within an individual channel) can be easily observed & tracked. The growth and/or migration of cells within gel can often cause gel shrinkage or degradation. This problem is mitigated by the use of posts in AIM chips. The posts help to stabilize the gel and increase cell culture duration before the matrix collapses. The interstitial flow across the 3D hydrogel can be controlled by setting up a pressure gradient between the flanking channels. This can be achieved by having a larger media volume in one media channel than the other, or by setting shear flow regimes that establish a pressure differential. AIM chips enable users to control shear flow in media channels with/without creating a pressure gradient across the gel channel. Shear flows are typically set by connecting the chip to a standard syringe pump through accessory connectors. Vickerman V, Blundo J, Chung S and Kamm RD. Design, fabrication and implementation of a novel multi-parameter control microfluidic platform for three-dimensional cell culture and real-time imaging Lab Chip, 2008, 8, 1468–1477, DOI: 10.1039/b802395f. Many of the publications listed below were conducted on lab-made devices that form the basis of AIM Biotech chips. Papers that employed the commercial chips are marked with '*'. Design, fabrication and implementation of a novel multi-parameter control microfluidic platform for three-dimensional cell culture and real-time imaging. Vickerman V, Blundo J, Chung S, Kamm RD. Lab Chip, 2008, 8, 1468-1477. Cell migration into scaffold under co-culture conditions in a microfluidic platform. Chung S, Sudo S, Mack PJ, Wan C-R, Vickerman V, Kamm RD. Lab Chip, 2009, 9(2):269-75. *Ex Vivo Profiling of PD-1 Blockade Using Organotypic Tumor Spheroids. Jenkins RW, Aref AR, Lizotte PH, Ivanova E, Stinson S, Zhou CW, ... Barbie DA. Cancer Discov. 2017 Nov 3. pii: CD-17-0833. doi: 10.1158/2159-8290.CD-17-0833. On-chip human microvasculature assay for visualization and quantitation of tumor cell extravasation dynamics. Chen MB, Whisler JA, Fr?se J, Yu C, Shin YJ and Kamm RD. Nat Protoc. 2017 May; 12(5): 865–880. *Stimuli-Responsive Nanodiamond-Based Biosensor for Enhanced Metastatic Tumor Site Detection. Wang X, Gu MJ, Toh TB, Abdullah NLB, Chow E. SLAS Technol. 2018 Feb;23(1):44-56. doi: 10.1177/2472630317735497. Epub 2017 Oct 11. *A 3D microfluidic model for preclinical evaluation of TCR-engineered T cells against solid tumors. Pavesi A, Tan AT, Koh S, Chia A, Colombo M, Antonecchia E, Miccolis C, Ceccarello E, Adriani G, Raimondi MT, Kamm RD, Bertoletti A. JCI Insight. 2017 Jun 15;2(12). pii: 89762. doi: 10.1172/jci.insight.89762. *CDK4/6 Inhibition Augments Anti-Tumor Immunity by Enhancing T Cell Activation. Deng J, Wang ES, Jenkins RW, Li S, Dries R, Yates K, ... Wong KK. Cancer Discov. 2017 Nov 3. pii: CD-17-0915. doi: 10.1158/2159-8290.CD-17-0915.